Hints to Lady Travellers: How Do You Say 'Glutton' in Italian? 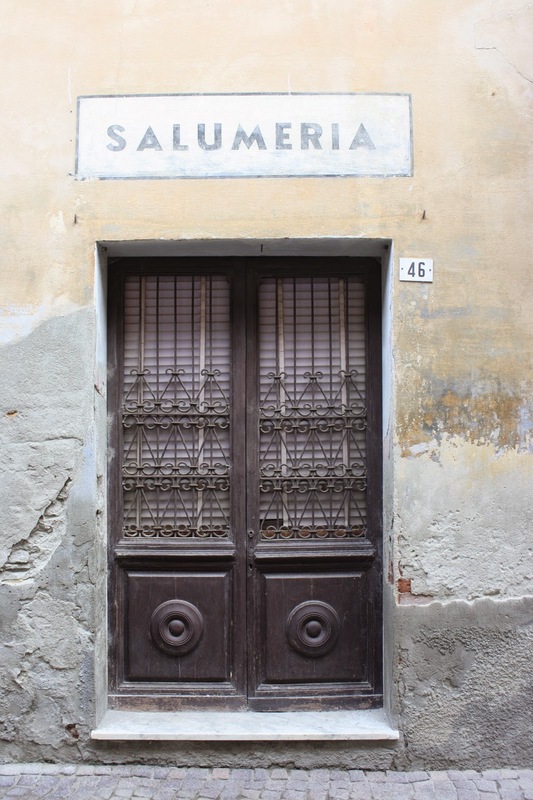 Yes, it has occurred to me that writing about Italian food is somewhat redundant - it's not as though I were the first person to record my thoughts on the subject. That said, I thought I would share a few food highlights and hints from my recent visit on the grounds that I always like reading about or hearing about what people eat on their travels. My first coffee of our stay was in Milan airport, just after baggage claim. There I realised a couple of things. First, a cappuccino is greatly enhanced by a ciambella, a kind of lemon-scented doughnut. Second, there is a particular protocol at Italian coffee bars. You order and pay at one counter, then take your receipt to a second counter where the actual coffee-maker (person, not machine), reviews the receipt, marks it and then prepares your coffee. Living in Italy, much as I like the idea, might be dangerous to my health. My ideal breakfast is essentially coffee + cake - what Elizabeth Gilbert describes as the 'Italian speedball breakfast' in Eat, Pray, Love. My urge to start the day with caffeine and sugar (ideally some chocolate in there too) is one I try not to indulge to often. But when everyone else is doing it…. At the agriturismo I compromised. I had yoghurt and fruit every morning and usually a small sample of the savoury 'special' - the mini frittatas and the small cheese pies, like Greek tiropita, were especially good. And then I had a slice of cake and a cappuccino. And then I ran up and down several hills, often with a small nephew on my back. I am a pizza purist. No complicated toppings, please. We discovered that my six-year-old nephew shared my exact tastes: we discovered this when his pizza arrived and my pizza arrived and he looked at his and looked at mine and then sweetly suggested I might like to swap. (I do mean sweetly. At six, his talent for guile is underdeveloped.) Instead we shared, and learnt together to say 'pizza con salume crudo, per favore'. If you like pizza with pepperoni, this is what you should say, too. Yes, please. Always. I loved the roasted red peppers wrapped around a slightly fishy mayonnaise and the raw vegetables with bagna cauda, featuring garlic, olive oil, anchovies and a little cream, eaten fondue-style. The funny thing is I don't normally eat a lot of pasta. But when it appears as one course among many - and in a relatively modest portions, not the huge vats that get served up in restaurants elsewhere - why, it seems foolish not to partake. My favourite were tortelli (similar to ravioli) filled with pumpkin and a hint of cinnamon and decorated with sage. I am still thinking about the pork loin with honey and a sauce made from slightly sour berries. And the small, crispy potatoes cooked under the joint and flavoured with just enough rosemary. I would never make it as a vegetarian in a world where such delicious maialino exists - nor for that matter would I survive long without potatoes. You can take the girl out of Ireland, etc. I see a potato, I eat it. Even allowing for trends in food fashions, as in everything else, I have never understood why tiramisu fell out of favour. Sponge fingers soaked in alcohol and coffee, served with mascarpone cream and chocolate. What's not to like? In fact, I liked it so much that I had two helpings one night at our agriturismo. I also have a soft spot for the kind of deconstructed baked Alaska with soft Italian meringue, amazing vanilla gelato and sponge cake we ate one lunchtime. This may have been the same day as a tiramisu. I may have rolled home. In conclusion: try everything; three-dessert days are occasionally appropriate; Italians know their way around carbohydrates; always pack walking / running shoes to work off the indulgence.